Banff & Buchan MSP Stewart Stevenson has highlighted the importance of Ovarian Cancer Awareness Month, which takes place in March. "It is vital that awareness is raised of ovarian cancer and that vital funds are generated towards research into the disease as 12 women in the UK die of ovarian cancer, every day and it is the fourth most common cancer in women. Additionally, UK survival rates are amongst the lowest in the Western World and have changed little in the last twenty years. "Most women (75%) are not diagnosed until the cancer has already spread and research shows that almost all women diagnosed with early stage disease do experience symptoms, combating the myth that this is a 'silent killer'. Women with persistent, frequent, and sudden onset symptoms, often abdominal in nature, should ask their GP if they have considered ovarian cancer. This should be the case if treatment for other conditions is not effective. "For those who wish to find out more, they should visit www.ovarian.org.uk"
Banff & Buchan SNP MSP Stewart Stevenson, has pledged to support RNID Scotland, the national charity representing Scotland's 758,000 deaf and hard of hearing people, in its call for the Scottish Executive to start measuring and publishing audiology waiting times by the end of 2007. Waiting times for audiology services are not currently counted in Scotland. It is impossible to tell whether NHS Board areas are meeting the Executive's target of 26 weeks for a person to be referred by their GP for a hearing assessment to actually getting a hearing aid fitted. "I am happy to back any initiative which will speed up the waiting times for people who require hearing aids. "I know from my mailbag and constituency surgeries that this is an important issue to a lot of people and I applaud RNID Scotland for this initiative." "It's great that Stewart Stevenson is joining RNID Scotland's call on the Scottish Executive to start publishing audiology waiting time figures. Audiology waiting times are unacceptable in many parts of Scotland, with some people waiting up to two years for a hearing aid. People need to know how long they will wait for a hearing test and then to be fitted with a hearing aid. The true picture won't be known until the Scottish Executive takes action and publishes the data. "Additionally, the Scottish Executive should publish a timescale detailing when NHS Scotland audiology services will meet the 18-week waiting time target for people to receive their hearing aids from the point of GP referral, as recognised by the NHS National Waiting Times Unit. It makes no sense to make people wait so long for an inexpensive but vital piece of equipment that can make such a difference to their everyday lives and reconnect them to society." For further information on deafness and hearing loss, please contact RNID's information line on telephone 0808 808 0123, textphone 0808 808 9000 or visit www.rnid.org.uk. The poll also shows support for independence ahead, with 46% in favour to 44% against. "I am delighted with this poll. It confirms that the SNP are in the driving seat in this campaign. "More and more voters are supporting our positive policies to build a successful Scotland. The SNP are working hard to earn the trust of the Scottish people, with policies to make Scotland wealthier, healthier and safer. We are delighted that more and more Scots share our ambition for Scotland. "We are ahead for three reasons. A positive campaign will always win over a negative campaign, a Scottish campaign will beat a London-based campaign and Alex Salmond is Scotland's choice for First Minister over Mr McConnell. "Far from Labour closing the gap, as they have been claiming, we are consolidating our lead with only two months to go until polling day. "Labour's campaign is in substantial disarray. "Perhaps this explains why Mr McConnell is hiding away rather than publicly debating head to head with Alex Salmond. "It's time for a fresh approach to meeting Scotland's challenges and opportunities. It's time for an SNP Government with Alex Salmond as First Minister." 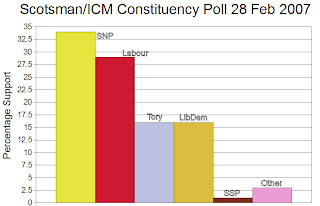 NOTE: ICM Research interviewed a random sample of 1,004 Scottish adults aged 18+ by telephone on 23-26 February. 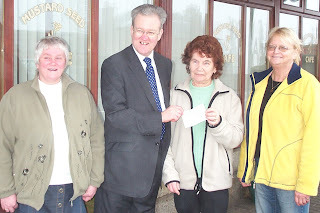 New Deer Friendship Club has benefitted from a £60 donation courtesy of Banff & Buchan MSP Stewart Stevenson taking part in an opinion survey for a national research organisation. The survey organisers offered MSPs a £60 donation to a good cause in their constituencies if they took part. Mr Stevenson did and nominated the New Deer Friendship Club on the recommendation of South Buchan SNP councillor Norma Thomson. “I was pleased to be able to help New Deer Friendship Club simply by answering some questions. CONCERNED pharmacists have spoken out against the decision of a drug corporation to restrict the supply of their medicines to only one supplier for the whole of Scotland. International drug corporation Pfizer are to change their supply system at the start of next month which will mean all pharmacies throughout the country will be supplied by one company based in Livingston. Pharmacists fear that this change will have financial implications and affect their quality of service. Pfizer products are currently available to pharmacies from a number of sources but as of March 5 their medicines, which include cholesterol lowering statin Lipitor and Viagra, will only be available from UniChem. "They are changing a distribution system that up until now has worked very well," she said. "They want more control of their own market and to set their prices to make more money. "At the moment we get two deliveries a day and one on a Saturday morning but this means all pharmacists opening a UniChem account and I'm not sure how it's going to work. "It will mean we'll have to hold more stock and that in itself has financial implications." Currently Purdie's pharmacy can receive a same-day delivery service. But she was keen to stress that their is no threat to the supply of medicines for patients. "Pfizer may be one of the biggest pharmaceutical corporations in the world but it is clear in this case that they have either not understood the situation in the North of Scotland or have deliberately ignored the difficulties they will create for community pharmacies here. "What we have here is an example of a global corporation riding roughshod over the needs of its customers and dictating not only the terms and conditions of how how community pharmacies should run their business but also who they should give their business to. "This is unacceptable to me and unacceptable to community pharmacies in my constituency, many of whom have contacted me and are absolutely up in arms at these proposals. "I am calling on the Health Minister and the Competition Commission to investigate Pfizer's proposals because not only are they anti-competition, they also have the potential to cost the NHS more money in the longer term." "We wanted to make this change as easy as possible for pharmacy and our original intention was not to work with just one provider. "However, after intensive discussions with all national UK wholesalers and a competitive appointment process, Pfizer chose to partner with UniChem. "This was for a number of reasons but mainly because of their shared concerns for patient safety, their operational capabilities and their ability to provide 100% UK coverage." Banff & Buchan MSP Stewart Stevenson has criticised a proposal put forward by the Liberal Democrats for a new quango to oversee the farming industry. Mr Stevenson – a strong critic of bodies such as the Scottish Environmental Protection Agency (SEPA) for their overbearing approach to regulation – said that less interference was needed in agriculture, not more. “I’ve been pressing agencies like SEPA and the Scottish Executive hard for less bureaucracy for farmers. When I first became an MSP, the issue of paperwork was raised with me at the first farm I visited. I asked the farmer to show me the paperwork relating to one beast and it took up most of his kitchen floor. “That image has stayed with me and I have attacked this culture of bureaucracy everywhere I encounter it and raised it with the Minister for Rural Affairs. “That is why this latest proposal from the Liberal Democrats just cannot be taken seriously. For the past eight years, they have been one of the parties of Government in Scotland and one of their own MSPs has been Minister for Rural Development through all of that time. “The Liberals cannot have it both ways. They are part of the administration which has done nothing to curb the rapacious expansion of SEPA, the near doubling of its staff, and an explosion of regulations which mean that farmers are now even expected to pay for a license for using tar planings to mend their road. If they were truly serious about tackling regulation they’ve had eight years in Government in which they could have done it. “I took the opportunity to highlight the importance of safety on our streets and the principle threats to that safety. Alcohol is certainly our biggest problem. Drugs are a huge criminal justice problem, but they do not pose the same kind of problem that alcohol poses on so many streets in Scotland's rural and urban areas. “I called for a greater more visible police presence on our streets to tackle crime and hailed the merits of community wardens, a proven success in Banff and Buchan. Unlike this Lib-Lab coalition with its disgraceful record on crime, an SNP government will put local communities at the heart of our policing strategy. “This debate is about the effectiveness and reliability of our criminal justice system - that the right people are convicted of the right crimes and justice is done . I am pleased to see that it has been taken so seriously and there is a consensus that this is a subject that is worth debating. “What England has done is certainly interesting. It has restricted to a narrow range of offences the ability to bring someone back for a new trial. Were changes to be made in Scotland, I think that there would be broad agreement that it would be necessary to restrict the offences for which a retrial might be sought. "It's time for a credible and coherent prison policy that locks up dangerous offenders and deals with petty offenders in the community. "Rather than filling up prisons with minor offenders and building private prisons that cost the tax payer millions, an SNP Government will ensure that prisons are used to detain dangerous criminals and punish serious offences. "Only the SNP can win the election in May and deliver the positive changes we need to reform our justice system." The prison service said staff were "coping well" with the numbers Scotland's prison population increased by about 5% last year, statistics have revealed. Scottish Prison Service figures showed that in 2006 the number of young offenders jailed in Scotland increased by 12% and female inmates rose by 6%. Justice Minister Cathy Jamieson said measures had already been introduced to tackle the rising population. The Scottish Conservatives said more prisons should be built while the SNP called for a review of sentencing. The provisional statistics suggested that the average daily prison population increased by about 5% in 2006, to 7,111. The average number of people locked up while awaiting trial rose by 24%. The figures also revealed the average number of prisoners sentenced to less than four years increased by about 3% to 2,776, while inmates serving longer sentences decreased by 2% to 2,854. A Scottish Prison Service spokesman said staff were "coping extremely well" with the record numbers. "More people in prison means more pressure on prison facilities, resources and staff. "And this itself means less time to work with prisoners to address the behaviour that put them behind bars in the first place. "That's why we are moving forward with action on three fronts." The minister said measures introduced by the executive included an increased range of community sentences and record levels of investment in the prison estate. "Rather than filling up prisons with minor offenders and building private prisons that cost the taxpayer millions, an SNP government will ensure that prisons are used to detain dangerous criminals and punish serious offences." Scottish Conservative leader Annabel Goldie said the executive should "have the courage" to build more prisons if they are needed. "Spain imprisons four times more people than Scotland relative to recorded crime, and Ireland three times more," she said. "Unsurprisingly, the deterrent is such that crimes per capita in both Ireland and Spain are around a quarter of the level here. "The proper use of prison will eventually lead to a reduction in prisoner numbers, but that will only happen when more police are in our communities, we end the scandal of automatic early release, we adopt a zero-tolerance approach to drugs and put in place effective rehabilitation services." Deputy First Minister Nicol Stephen was reproached in parliament yesterday for the time he takes to give written answers to MSPs' questions. The performance of Mr Stephen was called into question by Banff and Buchan MSP Stewart Stevenson, who raised a point of order at the end of yesterday morning's question time session to allege that the minister was breaching parliament's standing orders. Mr Stevenson cited an audit by the Scottish Executive of answers over a three-month period last year, which showed Mr Stephen had answered 46 of his 130 questions within the required time of 10 counting days - days when the office of the parliament clerk is open. This, Mr Stevenson said, compared unfavourably with Health Minister Andy Kerr, who had missed the deadline for only one of his 202 questions. Mr Stevenson said that, in total, Mr Kerr had answered 86% of his 4,617 questions on time, while Mr Stephen had managed to get 59% of replies to his 3,437 out in time. Presiding officer George Reid was asked by Mr Stevenson if this constituted a breach of standing orders and, if so, what sanctions could be imposed. Mr Reid replied that there was no breach if a holding answer was given within 10 counting days. These normally consist of ministers stating they will "reply to the member as soon as possible". The presiding officer understood this had always been the case. He said: "The figures quoted by Stewart Stevenson are for substantive answers, not for holding answers. As a result, although the differences in performance are striking, they are a matter for the Scottish Executive, not for me." Mr Stephen later defended his record in answering questions. He said: "Of the hundreds of parliamentary quest-ions I have answered recently, only one is currently outside the 10-day target time. "I often request additional information to ensure that the answers are as helpful as possible. As a result, the 10-day target time is not always met. "I do, however, always aim to meet the 10-day deadline wherever possible." THE political pundits are in general agreement that the outcome of the Holyrood elections in May is too close to call. However, it is clear that the animosity between the Scottish National Party and the Liberal Democrats is mounting almost on a daily basis. Both parties have strong rural connections and it is becoming obvious that the countryside vote could be crucial in determining which party forms the next administration and who any subsequent coalition might involve. Farmers are watching developments on the political front with increasing fascination, and many are likely to vote tactically. Bureaucracy is a hot issue. Last week Andrew Arbuckle MSP, the deputy rural affairs spokesman for the Lib Dems, proposed a new monitoring body to scrutinise many of the organisations farmers have to deal with. He said: "It may seem strange to propose setting up another body to ensure proper implementation of regulation, but this would be composed of practical people who would be required to go out into the fields and into the farm offices to hear at first hand of problems facing the farming industry." That has gone down like the proverbial lead balloon with Stewart Stevenson MSP, who represents the SNP in Banff and Buchan. He said: "When I became an MSP, the issue of paperwork was raised at the first farm I visited. I asked the farmer to show me the paperwork relating to one beast - it took up most of his kitchen floor. "That is why this latest proposal from the Lib Dems cannot be taken seriously. For the past eight years they have been one of the parties of government in Scotland and one of their MSPs [Ross Finnie] has been the minister for rural development through all of that time. "They cannot have it both ways. They are part of the administration which has done nothing to curb the rapacious expansion of SEPA [the Scottish environmental protection agency], the near doubling of its staff and an explosion of regulations. If they were truly serious about tackling regulation, they have had eight years when they could have done something." Arbuckle responded: "Scotland would not be the first country in the EU taking a step to set up a monitoring organisation. Most of the legislation affecting agriculture originates in Brussels, but other member states appear to cope with it better than we do. "My proposal does not mean that farmers can duck out of their responsibilities, but it will ensure that they are not squeezed out of business by duplication of paperwork, or gold-plated regulation." As the war of words moved on, Stevenson asked Ross Finnie in a written question why nearly 700 farmers and crofters had lost out to the tune of more than £1.25 million in their entitlements to the new single farm payment scheme over the past two years. The total surrendered was modest in the context of the £450m paid out each year, but it is important to the losers, said Stevenson. He said: "These penalties were, in the vast majority of cases, incurred as a result of innocent errors rather than fraud." Finnie, in a written answer, said: "If any business feels that decisions by SEERAD on issues affecting subsidies are wrong, they have recourse to an appeal procedure without an initial cost. But the ultimate arbiter will be the Scottish Land Court." 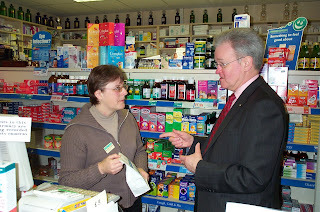 Banff & Buchan SNP MSP Stewart Stevenson has branded plans by international drugs corporation Pfizer to restrict the supply of their medicines to only one supplier in Scotland as a threat to rural community pharmacies. Mr Stevenson launched his attack on Pfizer after being contacted by worried pharmacists in his constituency who say that the plans will put at risk the security of supply of patient medicines in the North of Scotland and force them to deal with a wholesale firm which has no distribution depots north of Livingston. “Pfizer may be one of the biggest pharmaceutical corporations in the world but it is clear in this case that they have either not understood the situation in the North of Scotland or have deliberately ignored the difficulties they will create for community pharmacies here. “What we have here is an example of a global corporation riding roughshod over the needs of its customers and dictating not only the terms and conditions of how how community pharmacies should run their business but also who they should give their business to. “This is unacceptable to me and unacceptable to community pharmacies in my constituency, many of whom have contacted me and are absolutely up in arms at these proposals. A Parliamentary Question tabled by Banff & Buchan MSP Stewart Stevenson has revealed that nearly 700 Single Farm Payment claimants in 2005 and 2006 had penalties totalling over £1¼ million applied to their claims due to errors found within the completed forms. The Scottish National Party MSP questioned Rural Development Minister Ross Finnie and is now calling for advice to be made available to farmers based on an analysis of the most common errors, and for more to be done to avoid SFP claims reaching the stage where penalties are applied. “In the context of the overall numbers involved, this may not seem like a large problem, but I know from my mailbag that it is an extremely serious problem if you are one of the claimants found to have made an error. “The ramifications and knock-on effects for the farm business can be substantial and are in many cases entirely avoidable if a helping hand was available from officialdom. “It is clear from cases that I and other MSPs have come across that the vast majority if not all of these penalties were incurred as a result of innocent errors rather than fraud. Banff & Buchan MSP Stewart Stevenson will visit the community pharmacy at S&N Purdie, 14 Main Street, New Deer on Tuesday 20 February (tomorrow) at 10.00am. Mr Stevenson will discuss the latest threat to community pharmacies in the North of Scotland and their continuity of medicine supplies posed by the actions of one of the world's biggest pharmaceutical companies. Speaking in a parliamentary debate on ‘Making the NHS Local’ Banff & Buchan MSP Stewart Stevenson has stressed the benefits of local healthcare provision. In his speech Mr. Stevenson highlighted the recent case of threatened maternity units in Banff and Fraserburgh and commended the Health Minister Andy Kerr on his decision to maintain birthing units in the local hospitals. "This is the central tenet of what we are all trying to do and the central summary of the Kerr report. "I thank the minister for his support on maternity services by intervening to correct what would have been a serious wrong for essential local delivery of services in my constituency. "Community care units are an important part of future provision; indeed, we should have more of them. They may well even serve a useful purpose by being co-located with accident and emergency units. "In today's debate, members have illuminated many of the challenges that remain, talked about some of the successes and touched on areas in which further progress is essential. However, the bottom line is that the debate in the chamber is a lot less important than the debates that local communities are having about the health services that they require in their local areas." People with convictions account for nearly a tenth of crimes recorded by police in Scotland, the executive has revealed. Ministers were asked in a parliamentary question what percentage of crimes had resulted in a conviction in each year since 1999, broken down by police force area. Justice Minister Cathy Jamieson said figures for recorded crime and court proceedings were not directly comparable for several reasons. Because of this, the statistics she gave were in a different form to those asked for by Banff and Buchan MSP and SNP deputy justice spokesman Stewart Stevenson. Ms Jamieson provided figures for people who had been convicted in Scottish courts, expressed as a percentage of crimes recorded by the police. They showed that, in each year between 1999-2000 and 2004-05, the national level was 10%, except in 2000-01, when it was 9%. In most years, Central Scotland Police had the highest or joint-highest rate, while Lothian and Borders was always lowest or joint-lowest. Grampian was on the national average, or 1% either side of it, in each year. "A person may be proceeded against for more than one crime involving more than one victim, and a crime may be recorded in one year and proceedings taken in a subsequent year." Crimes committed by children will also generally be dealt with through the children's hearings system rather than courts, while some minor crimes can be dealt with by alternatives to prosecution such as fiscal fines. The implementation in April 2004 of the more victim-oriented Scottish Crime Recording Standard increased the numbers of minor crimes recorded by the police, such as minor crimes of vandalism and minor thefts." Despite these qualifications, Mr Stevenson found the figures disappointing and said they suggested a "marginal proportion" of convictions. "This is an extremely poor reflection on the effectiveness of our criminal justice system," he said. "It is blatantly obvious that the police require more funding to enable them to effectively perform their role of crime detection and prevention. "Funding and resources would clearly be far better invested in the police force than in a deeply flawed and costly ID card scheme." L0ocal MSP Stewart Stevenson has given his support to a Buchan village’s campaign for road safety improvements. Buchan East Community Council has enlisted Mr Stevenson’s support in their efforts to improve road safety for pedestrians along the busy A90 trunk road which runs through the village. In a letter to the MSP, Transport Scotland advised that they hoped to install electronic speed signs in the village before the end of March. However, the community is lobbying for a pedestrian crossing to be installed in view of safety concerns. “While the community very much welcomes your commitment to introduce electronic speed indicator signs at Crimond, the underlying concern regarding the safety of the road for pedestrians crossing remains. Again, I would reiterate that within this village we have the shop, Post Office, GP surgery and school all located on the west side of the trunk road, while to the east side we have a car park which also serves the GP surgery and shop, housing for elderly people and also new housing developments. “I am fully supportive of the campaign by the local Community Council and commend them for the work they have done on this issue so far which has secured the commitment to install electronic speed signs. BANFF and Buchan MSP Stewart Stevenson has urged Aberdeenshire Council to look again at its decision to reduce the eligibility for taxicards for disabled persons. Mr Stevenson has written to the council following approaches from constituents and disabled groups who say that the move has not been fully thought out. "On the face of it, this must have seemed like a sensible decision to the council in order to reduce its costs. However, the decision has clearly not been thought through carefully enough as many people are going to be disadvantaged by this change in policy. "For example, Multiple Sclerosis sufferers, whose condition fluctuates so that they are able to drive on some days but not on others when their condition worsens have to fall back on taxicards in order to get around. "Likewise people who qualify for a Blue Badge or Motability car due to their medical disability but who are advised not to drive for periods following treatment for their condition in hospital. They, too, are being left at a disadvantage because of this ruling. "It is just not as simple as saying that people with a Blue Badge or access to their own Motability car don't need taxicards. I'm sure that given the choice, most people in that position will always choose their independence and the convenience of travelling under their own steam, which in itself saves the council money. "But by forcing people to choose between the two, I'm afraid the council is not only placing some disabled people at a disadvantage, but may actually end up costing the council-taxpayer more money as people opt for the taxicard scheme which they know they will always be able to use whether they have a 'good day', in the case of MS sufferers, or not." CALLS have been made to Justice Minister Cathy Jamieson for a definitive decision on the future of Peterhead Prison no later than March 2008. The request was made by Banff and Buchan MSP Stewart Stevenson when he met with the Justice Minister and SPS Director of Public Services, Rachel Gwynd, along with representatives of the Prison Officers' Partners Committee to discuss the future of the Peterhead jail. With no commitment yet shown by the Executive on the future of the prison, Mr Stevenson secured a commitment from the Minister that plans for the facility and allocated funding would be included in the draft Executive budget in September and that a clear decision would be made at the very latest by March 31, 2008. Having campaigned with the committee and other community groups to save Peterhead Prison, the local MSP also put pressure on the Minister to obtain responses from the Criminal Justice Authorities to the consultation on the future of North-east prisons published last year. "The Justice Minister has confirmed to me that a decision will be made on the future of Peterhead Prison at the very latest by March of next year and that we can expect to see these plans published in the draft budget in September. "Though we are still awaiting a funded commitment from the government to prison places in new premises, the outcome of today's meeting has been a positive development. "The delays and uncertainty surrounding the fate of the prison have been considerable and unsettling for all concerned so this news is very welcome. "I took the opportunity to impress upon the Minister and the SPS representative other issues of concern to the Committee, such as prison officers' morale and working conditions and to demand that they finally address these ongoing problems. "People in the North East are aware of the SNP's relentless dedication to this campaign. They can be sure of rapid action on this issue from an SNP Justice Minister in the next term. "However, a decision before the election by the present government could have ended this unnecessary delay. "This is a clear reflection of the Lab-Lib coalition's lack of commitment to the criminal justice system and to prison staff employed in our area." Mr Stevenson has also called for the human rights of Scotland's prison officers to be given priority in the country's prisons policy. The MSP - who is also the SNP's spokesperson on prisons and Shadow Deputy Justice Minister - made the call after a series of high profile 'human rights' claims by inmates in Scotland's prisons. "We have heard much in the media recently about prisoners bringing claims for compensation under Human Rights legislation because they have to slop out or because they've been denied the vote. In addressing the problem of slopping out in Scotland's prisons, I think it's time we placed the rights of the men and women who actually work in our prisons higher up the agenda. "The staff are day and daily confronted by prisoners slopping out. The exposure to smell and the risk of contamination is unacceptable in the 21st Century and I will be raising this with the Justice Minister in early course." Commenting at the official opening of the realigned Hatton bends today (Monday) Banff & Buchan MP Alex Salmond and MSP Stewart Stevenson, have hailed the completion of the long delayed improvements to the notorious stretch of the A90. The £5.5million project to upgrade the accident blackspot took forty-five weeks to complete, though the campaign to secure the road investment goes back over thirty years. 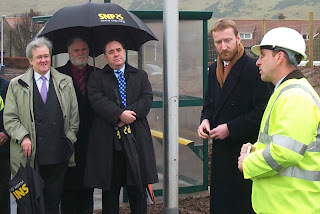 Along with Cruden councilor Jim Towers and local residents, Mr Salmond and Mr Stevenson have campaigned constantly to have the works undertaken, and so today's official opening has been claimed as an important local victory. However, Mr Salmond has said that the completion of the project is only the beginning of his party's plans to bring the local roads infrastructure into the twenty-first century – pledging to bring forward plans for the unbroken dualling of the A90 and A96 within the first 100 days of an SNP administration at Holyrood. "Naturally, I am delighted that this notorious stretch of road has at last been straightened. The campaign to have these improvements has been as long and winding as the road itself, and so today's official opening is a massive local victory. "However, although going some way to addressing the danger and delay that exists on our roads, the completion of this particular project is not enough. We need a proper link between Buchan and the rest of the country to match the industrial importance and potential of our area. I have already put on record my commitment to bringing forward plans to dual the A90 and A96 if elected Scotland's First Minister in May, and I am determined to lead a step-change bringing our transport network into the twenty-first century." "I am delighted that these works have now finally been completed after pushing successive Transport Ministers for an early start to these works. "With the prospect of major developments such as the construction of world's first commercial carbon-capture plant at Peterhead Power Station, the ongoing development of St. Fergus Gas Terminal and the prospect of a new prison being built in the area, Banff & Buchan had urgent need of a roads infrastructure built to serve the area's needs, and this is a very important part of that." Stewart Stevenson MSP has welcomed the launch of the 'Pass-Plus' scheme for young drivers in the North east today. But with the tragic toll of young drivers' lives in the North east, it is disappointing that drivers will have to pay £15 to enter the scheme. "I have repeatedly called for new innovative measures to support young drivers to improve their skills and reduce the death toll on northern roads. While support for this scheme in the North east is welcome - I would prefer to see it open to all young drivers at no cost. "I am putting some of my money where my mouth is, and the first ten under-25 year-olds who have passed their test within the last twelve months in Banff & Buchan constituency will have their £15 fee for entering the 'Pass-Plus' scheme paid for by me. "I hope that this idea will be taken up by others, and by the Scottish Executive, to ensure that as many young people as possible can make use of this scheme." Banff & Buchan MSP Stewart Stevenson has hosted an event in parliament to celebrate the second anniversary of the 'right to roam' access legislation as part of Scottish Environment Week. The access legislation within the Land Reform (Scotland) Act was hailed as a major achievement of the first term of the Scottish Parliament by Mr. Stevenson and speakers from the Ramblers' Association Scotland, the Loch Lomond and Trossachs and Cairngorms National Parks. "I am delighted to see that good levels of cooperation between farmers and other land managers and those enjoying the countryside are making this legislation work. With representatives of the Ramblers' Association Scotland and the two National Park Authorities this seminar brings together different stakeholders to celebrate the first two years of the Act." "As a member of the Justice 2 committee which steered the legislation through Parliament I was heavily involved in the process and am extremely pleased that the legislation has proven to be one of the greatest successes of the new Scottish Parliament. "Outdoor recreation is not only an enjoyable, healthy and affordable activity but also a major contribution to the Scottish economy, particularly in rural areas. Scotland's magnificent hills, parks and lakes generate considerable tourism which is a major boost to our rural economies. Scottish visitors alone spend £3.6 billion a year on outdoor recreation trips. "The rights enshrined in the Land Reform Act have greatly increased ramblers' access to lands while at the same time bestowing upon them a responsibility to respect the land and its proprietor. Scotland's natural attributes can now be enjoyed by all yet not at the expense of the landownder. This is clearly an Act well worth celebrating." Banff & Buchan MSP Stewart Stevenson has responded to the Scottish Executive's consultation on the Nitrate Vulnerable Zone Action programme proposed amendments and has backed calls by North-east farmers that any further restrictions imposed must be based on evidence. Mr Stevenson met with NFUS President John Kinnaird and North-east NFUS representatives at Thainstone last month along with SNP Leader Alex Salmond MP and other SNP Parliamentarians to discuss the issue. One of the main concerns expressed at the meeting was that the proposals for further restrictions in the NVZ areas was simply not supported by the scientific evidence available. "On the issue of NVZs, we have yet to see the evidence that justifies further restrictions on the spreading of manure and fertiliser. Indeed, the indications are that the measures the industry has been taking to date have had the desired effect. Yet the Government is proposing further 'closed periods' and a reduction in the Nitrate loading limit. "We need common-sense on this issue and we need to see the science on which the Government is basing its claim. The evidence just doesn't support the Government's assertions. "Following my very useful meeting with NFUS, I tabled Parliamentary Questions on the evidence issue and await Ross Finnie's response to these. In the meantime, I have made my own submission to the Scottish Executive's consultation paper highlighting those points which my constituents have raised with me and pointing out the apparent success of the measures taken to date in addressing the nitrates issue in the affected areas." NHS Grampian's revised proposals for the future of maternity services in local towns have been approved by Health Minister Andy Kerr. The controversial plan to close maternity services in north east towns caused an outcry. Maternity units in Aboyne, Banff and Fraserburgh will close and be replaced by part-time units led by midwives. Mr Kerr said it was important women should have a choice where to deliver babies when it was safe and sensible. Mr Kerr said: "I am pleased that the board has concluded that there is scope for providing birth units for low-risk women in Aboyne, Banff and Fraserburgh. I now look forward to seeing the board take those plans forward. "Of course, it will be for the board to determine the exact size and capacity of each unit, in accordance with local needs. "I'm confident NHS Grampian will now go on to provide birth units which offer a safe and sustainable service for women in the Aboyne, Banff and Fraserburgh areas." NHS Grampian chief executive Richard Carey said: "I am delighted that Mr Kerr has approved the final part of our proposals for health services in Aberdeenshire. "Birth units in Aboyne, Banff and Fraserburgh allow us to offer the choice of a local delivery to women in these areas. "I think it has been a very good compromise." West Aberdeenshire and Kincardine MSP Mr Rumbles said: "This is a real victory for people power and I am delighted that both the minister and now NHS Grampian have accepted the arguments. "I have nothing but praise for the campaigners." Banff and Buchan MSP Stewart Stevenson added: "The mothers-to-be who previously elected to give birth in their communities rather than trek into Aberdeen will continue to be able to do so. "That is great news for these mums and their children." The Save Aboyne Maternity campaign (SAM) has called for each community to be involved in planning the arrangements. NHS Grampian had recommended stopping the services over declining birth rates. Campaigners fighting to save the services had made the "last throw of the dice" by meeting Mr Kerr. Following the announcement of plans for birthing units in Fraserburgh and Banff, Banff & Buchan MSP Stewart Stevenson has spoken of his delight at the success of the community-based campaigns in persuading NHS Grampian to rethink their plans for closure of maternity units. "The mothers-to-be who previously elected to give birth in their communities rather than trek into Aberdeen will continue to be able to do so. That is great news for these mums and their children, and great news for Fraserburgh, Banff and Aboyne, who have fought so hard to retain this service. I congratulate all the mums – and dads – who have driven this change of heart through. "I suggested that NHS Grampian should look at the birthing units on Skye as the model for redesigned delivery of maternity services as long ago as April last year. At last, they have seen sense and responded positively to local demand. "Low-risk mothers should never have been considered for transfer to the impersonal, hi-tech, and over-used facilities in Aberdeen. That service is essential for births where there may be higher risk to mother or baby, but is an unneccessary complication for many. "The redesigned maternity services now proposed will allow all the mums who previously would have given birth in their communities to do so in future. They also provide a non-medicalised, 'family-friendly' service that represents value for money. "I've been delighted to be able to join campaigners, sometimes in atrocious weather, to promote this outcome and to speak in Parliamentary committees and debates and arrange meetings with Government Ministers and officials. But at the end of the day, it has been the mums who have made the case and have won the fight. Politicians needed their engagement to win these important battles." "We have seen a number of unwelcome changes in health provision in Fraserburgh over the last couple of years. While plans for additional services for the elderly and inform represent progress, the withdrawal of on-call GP services from the town and the failure to tackle the chronic shortage of NHS dental services have been body-blows to our community. "Now that we have achieved a rethink on maternity services, it is essential that NHS Grampian look again at the whole provision of community medical services in the North-east." Banff & Buchan MSP Stewart Stevenson, today (Wednesday) met with Justice Minister Cathy Jamieson and SPS Director of Public Services Rachel Gwynd along with representatives of the Prison Officers’ Partners Committee to discuss the future of Peterhead Prison. Mr. Stevenson secured a commitment from the Minister that plans for the prison and allocated funding would be included in the draft Executive budget in September and that a clear decision would be made at the very latest by 31st March 2008. Mr. Stevenson who has campaigned with the committee and other community groups to save Peterhead Prison also put pressure on the Minister to obtain responses from the Criminal Justice Authorities to the consultation on the future of North East prisons published last year. He also pressed the issues of prison staff working conditions and prison management. “The Justice Minister has confirmed to me that a decision will be made on the future of Peterhead Prison at the very latest by March of next year and that we can expect to see these plans published in the draft budget in September. Though we are still awaiting a funded commitment from the government to prison places in new premises, the outcome of today’s meeting has been a positive development. “The delays and uncertainty surrounding the fate of the prison have been considerable and unsettling for all concerned so this news is very welcome. “I took the opportunity to impress upon the Minister and the SPS representative other issues of concern to the Committee, such as prison officers’ morale and working conditions and to demand that they finally address these ongoing problems. “People in the North East are aware of the SNP’s relentless dedication to this campaign. They can be sure of rapid action on this issue from an SNP Justice Minister in the next term. “However, a decision before the election by the present government could have ended this unnecessary delay. This is a clear reflection of the Lab-Lib coalition’s lack of commitment to the criminal justice system and to prison staff employed in our area." Banff & Buchan MSP Stewart Stevenson has criticised the Conservatives after they dropped their key fisheries policy of withdrawal from the Common Fisheries Policy (CFP), but commended the Tory fisheries spokesman Ted Brocklebank for his principled resignation over the matter. Tory MSP Ted Brocklebank resigned from his party's cabinet after the Conservative Party in London rode roughshod over policies made in Scotland, and ditched the policy of withdrawal from the CFP. "Ted Brocklebank has taken a principled stand on the issue of withdrawal from the CFP and has resigned as his party's spokesperson after the London leadership forced the Scottish branch of the Tories to drop the policy. "It is entirely understandable that Mr Brocklebank should resign. After all, he was once a candidate in Banff & Buchan, the constituency where fishing is more important than anywhere else in the country, and presumably learned a thing or two from fishermen during his visits here. "It does, however, leave Conservative fishing policy all at sea. The Scottish fishing industry was once labelled as "expendable" in the Tory negotiations on entry into the EEC and it seems that a perfectly sensible policy made in Scotland for Scotland has been dumped by David Cameron and the Tory Head Office in London. "The Scottish fishing industry's only hope of scrapping the Common Fisheries Policy and regaining control of our own seas is through Independence and the SNP." Banff & Buchan MSP Stewart Stevenson has urged the UK Government to hold to its policy of denying convicted prisoners the vote. Mr Stevenson is the SNP’s spokesperson on prisons and is also Shadow Deputy Justice Minister in the Scottish Parliament. The MSP was speaking following last week’s speculation in the media regarding extending the right to vote to prisoners and revealed that he had responded to a consultation by the Department for Constitutional Affairs on 18 January, arguing that the present position was the correct one and that it enjoyed overwhelming public support. The UK Government is currently consulting on the issue following a ruling in the European Court. “First and foremost, I am opposed to any suggestion that convicted detained prisoners should be given the right to vote, far less any suggestion that they be compensated for not being allowed to vote. As far as I am aware, the Liberal Democrats are the only mainstream political party advocating that prisoners should have the right to vote. “I suspect it would be a very hard ‘sell’ indeed for the Government to convince the public that law breakers should have a say in the election of the law makers. “If we start from the premise that the removal of liberty is only considered for those who have breached the basic laws of our society then there can be no question of such individuals continuing to enjoy the most basic right in our democracy, the right to the franchise.